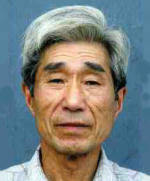 Knifesmith Hideo Kitaoka in Takefu, Fukui Province specializes in the production of high-quality kitchen knives. With all his knives, the cutting edges are forged from "white paper steel", a high-carbon steel that is very hard but not so brittle as one would expect. 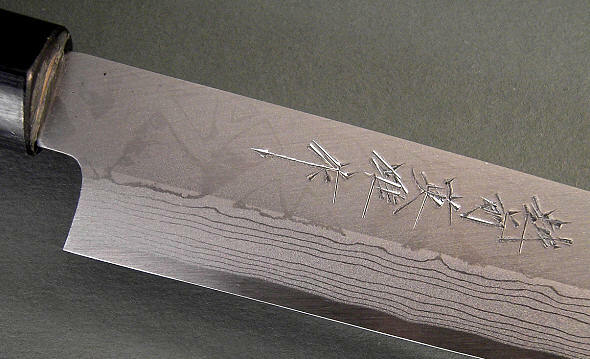 The outer layers of the blades are formed of many-layered Damascus steel, which is called "Suminagashi" in Japanese. The blades’ hardness is more than 60 HRC. These knives are not stainless steel! The elegant handle is made of sandalwood, and the ferrule is Asian buffalo horn. 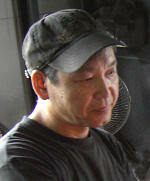 Take a look into the knife smithy of Hideo Kitaoka and watch him at work (with video). 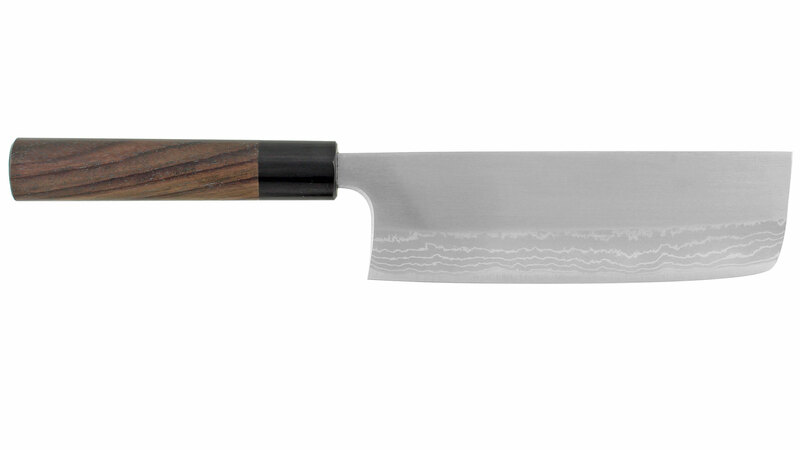 Matsuba Hocho Also called "Matuba"
A nice and small kitchen knife for universal use. Righthander Deba Hocho Chopping knife and cleaver. The blade is sharpened on one side. The cutting edge, in white paper steel is laminated on one side to 12 layers of Damascus steel. The handle is of sandalwood, the ferrule of buffalo horn. 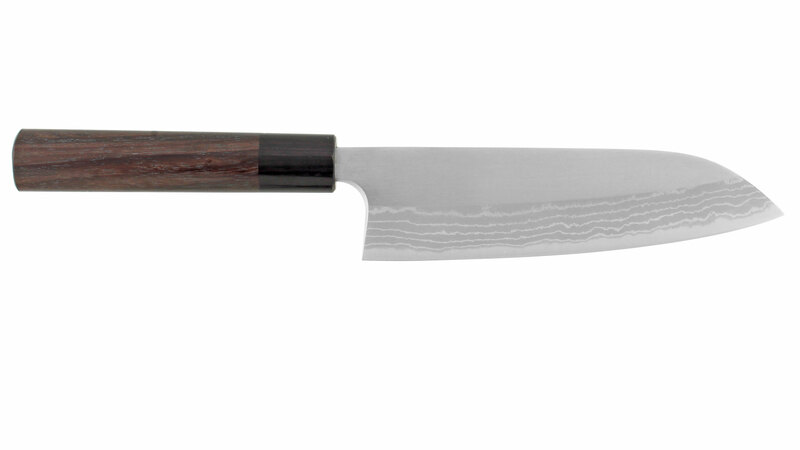 Righthander Sashimi Hocho Blade 240 mm This is the most common knife for preparing sushi and filleting fish. is laminated on one side to 12 layers of Damascus steel. The handle is of sandalwood, the ferrule of buffalo horn. Mioroshi Hocho - Large All-Purpose Knife Also called "Oroshi" or "Orosi" knife. It is a pleasure to cut with this big, thick, and sharp knife! Blade is sharpened only on right side and therefore only for righthanders. The cutting edge, in white paper steel, is laminated on one side to 12 layers of Damascus steel. The handle is of sandalwood, the ferrule of buffalo horn. In Takefu too, next door to Hideo Kitaoka master blacksmith Katsushige Anryu has his forge. 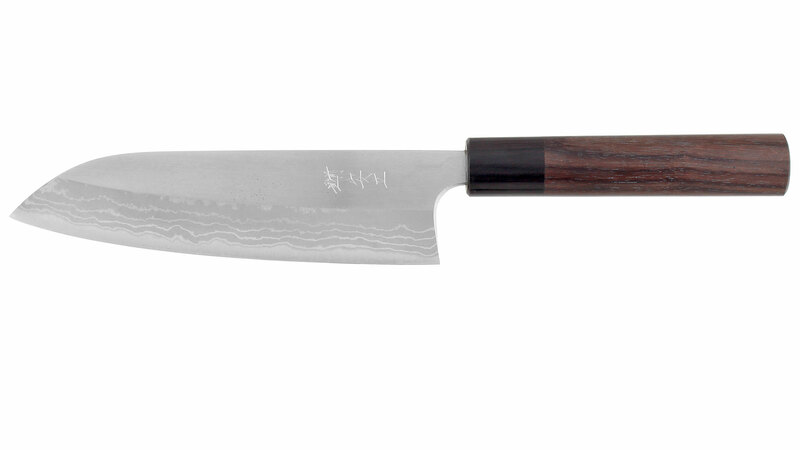 Beyond his own knife program he makes the Santoku and the Nakiri of the "Kitaoka Series". The outer layers of the blades are formed of 5 layered Damascus steel each side, the cutting edges are forged from "white paper steel". The blades’ hardness is more than 60 HRC. These knives are not stainless steel! 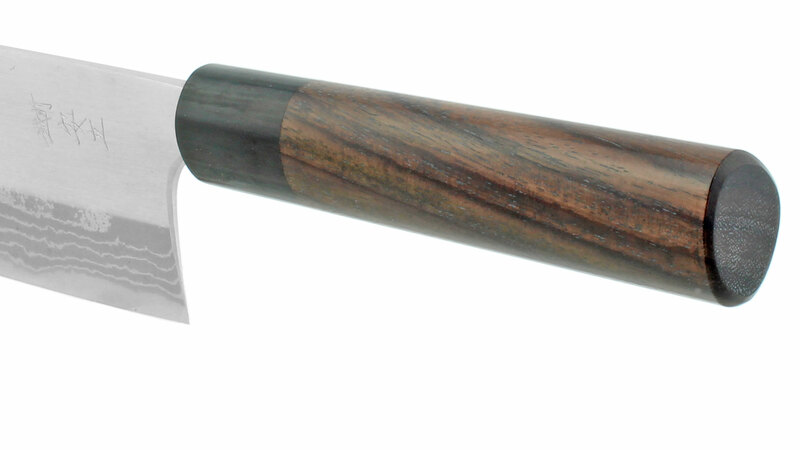 The elegant handle is made of sandalwood, and the ferrule is Asian buffalo horn. Santoku Hocho - All-Purpose Kitchen Knife All-purpose kitchen knife. Both sides of blade are sharpened. The cutting edge, in white paper steel, is middle of three-layer laminate. The outer laminates are in 6-layer Damascus steel, the handle in sandalwood, and the ferrule in buffalo horn. Nakiri Hocho - Vegetable Knife Both sides of blade are sharpened. is middle of three-layer laminate. 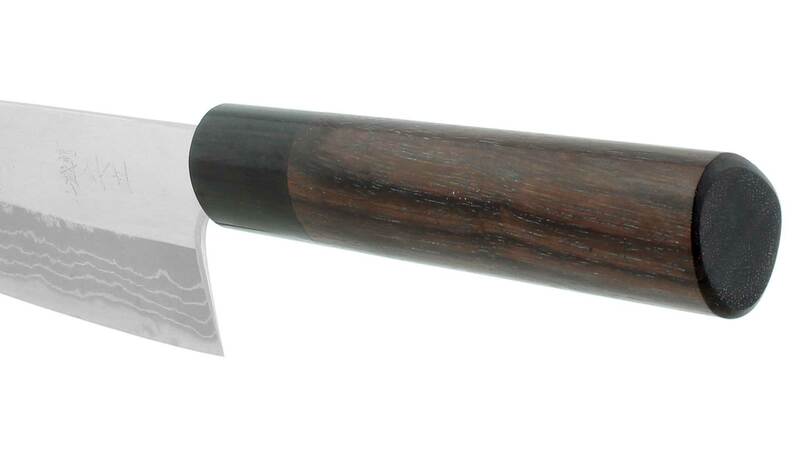 The outer laminates are in 6-layer Damascus steel, the handle in sandalwood, and the ferrule in buffalo horn.